Right before Maurice Sendak died, he did a series of interviews (most notably with Stephen Colbert) that revealed him to be a lovable, slightly grouchy, artist of the highest caliber. I’d known his work, of course, from Where The Wild Things Are and, perhaps more obscurely, Really Rosie but I’m embarassed to say I knew nothing about In The Night Kitchen until I read it standing up, recently, at The Strand in New York. It’s an incredibly weird, incredibly beautiful book. 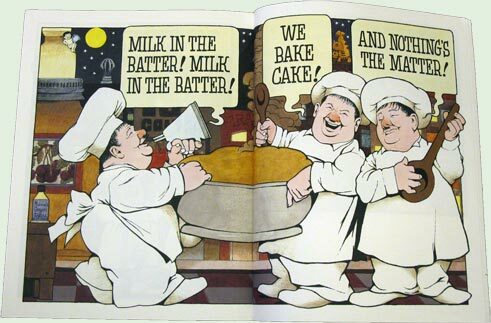 I don’t have it in front of me but I can sum up the plot based on what I remember: a naked little boy falls out of bed into a cake batter being prepared by bakers who all look like Oliver Hardy. Just before the cake goes into the oven, the boy flies out into a tall container of milk. He pours it into the cake batter for the bakers before crowing and falling back into bed. The end. However you interpret it, what the book suggests is that the kitchen–and the idea of cooking–tap into primal emotions that children understand on a very deep level. 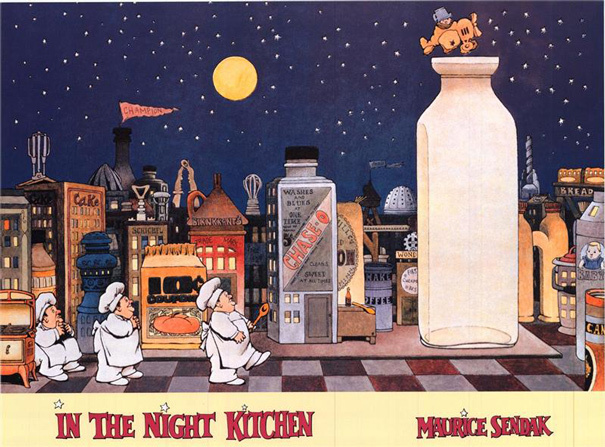 For a long time I’ve been trying to figure out what kind of art to put over my desk and finally I settled on a poster for In The Night Kitchen, the image you see at the top of this post. It feels like a perfect choice because it’s a book that illustrates, quite profoundly, the mystical, psychological, and emotional energy that surrounds my chosen vocation. Thanks, Maurice Sendak, for capturing that so beautifully in your book.